August Löhr was an Austrian landscape artist, born in 1843 (some sources say 1842) in Hallein near Salzburg. Löhr lived and worked in Europe, the U.S. and Mexico. After studying at the Royal Academy of Fine Arts in Munich, Germany, Löhr initially specialized in painting Alpine scenery. He and his Austrian wife Franziska Geuhs had three daughters, Rosina, Elise and Elsa, all born in Munich. From 1879 to 1881 Löhr worked with the Munich art professor Ludwig Braun to paint a panoramic view of the Battle of Sedan. The two men also worked on panoramic scenes of the battles of Weissenburg and St. Privat. By 1884, Löhr had traveled to New Orleans to supervise the installation of the panoramic painting The Battle of Sedan, displayed for the World’s Industrial and Cotton Centennial Exposition in New Orleans (1884-1885). Later in 1884, Löhr joined William Wehner in establishing the American Panorama Company in Milwaukee, where they commissioned approximately twenty German artists to paint monumental “cycloramas” depicting the Storming of Missionary Ridge, the Battle of Chattanooga and the Battle of Atlanta. In 1887 Löhr, in association with Frederick Heine, purchased the Wells Street studio from the American Panorama Company and created the panorama Jerusalem on the Day of the Crucifixion. Several other panoramas were also produced at the Wells Street studio. In 1898, after the end of the Spanish American War (1895-1898), Löhr joined other panorama artists in San Francisco to paint The Battle of Manila Bay. The following year, the San Francisco Sentinel reported that he was the manager of a company that was planning to exhibit panoramas in Mexico. (This was probably the short-lived Milwaukee Panorama Company, of which Löhr was Vice President in 1890). Although his name appears in the 1890 Milwaukee city directory, he probably left Milwaukee for Mexico in 1890. Though details are sketchy, it is believed he resided in Mexico with his family until his death in 1919. Mexico paintings by Löhr are known with dates ranging from 1899 to 1915. In 1891, Löhr’s painting of Chapultepec Castle was exhibited at the San Carlos Academy in Mexico City. In 1899, Löhr exhibited two Californian landscape paintings (one of Mt. Tamaulipas, the other of the Santa Cruz Mountains), in San Francisco at the Mechanics Institute Fair. 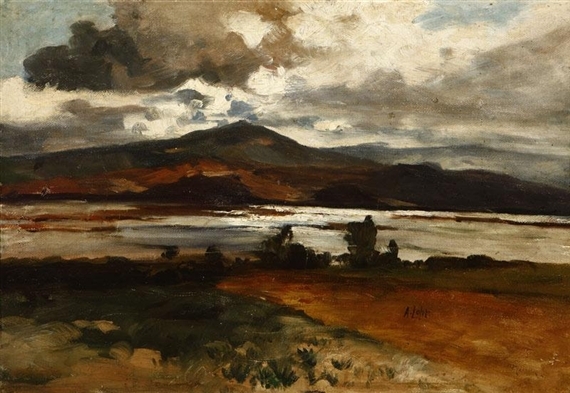 Löhr’s oil painting “Lake Chapala, Mexico” (see image) was probably painted circa 1905. German-American Artists in Early Milwaukee, A Biographical Dictionary, by Peter C. Merrill.